This November we are supporting Balls not Breasts! This Special Edition Movember lip balm is enriched with hemp seed oil and beeswax to moisturize and protect your lips against environmental elements. 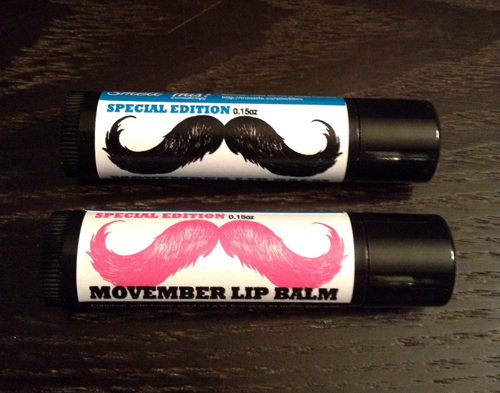 But even better... $2.50 of every lip balm purchase goes back to Movember. During November each year, Movember is responsible for the sprouting of moustaches on thousands of men’s faces, in Canada and around the world. With their “Mo’s”, these men raise vital funds and awareness for men's health, specifically prostate cancer and male mental health initiatives. The funds raised are directed to programs run directly by Movember and our men’s health partner, Prostate Cancer Canada. Together, these two channels work together to ensure that Movember funds are supporting a broad range of innovative, world-class programs.